Team Levy was just one of the many teams that showed up to compete in last weekend’s Redfish Triathlon and Sprint Duathlon. 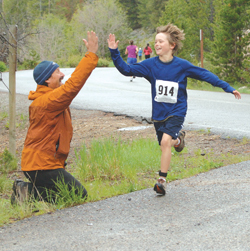 Here, Scott Levy high-fives his nephew Mikey Levy as he dashes through the run portion of the event. More than 200 people showed up to race despite the cool temperatures and rainy weather. Why wait on Ketchum budget?